We need your help to transform the life of a little girl. Being an identical twin, McKinley’s family was always looking for distinguishing traits between her and her sister. By the New Year, as the girls approached four months old, those traits began to suggest more significant differences. McKinley was enrolled in the local Early Intervention program whose support and guidance over the next three years would prove to be priceless. The next year brought several visits to the neurologist, physiatrist, geneticist, orthopedist, gastroenterologist, and near daily sessions with her social worker, physical, occupational, and speech and language therapists. Ultimately, McKinley received a diagnosis of spastic quadriplegia, a form of cerebral palsy. Cerebral palsy is a form of brain damage that affects muscle function, and spastic quadriplegia identifies that all four quadrants (limbs) have tense muscle tone. The consequence is that McKinley has very limited control over her body, as well as her ability to produce speech. Yet never in her life has she been unable to make her joy in playing games and having fun, or her love of being with her family, clearly known. Her contagious smiles and gleeful squeals have melted the hearts of everyone who has come to know McKinley. Her persistence and commitment to making herself understood have also led to the development of many adapted sign language expressions, as well as the ever-improving use of assistive communication devices, to allow McKinley to express herself with increasing complexity. 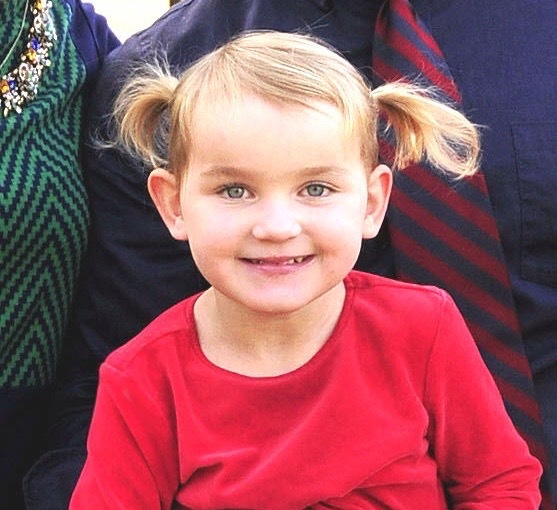 Consistently, McKinley makes clear her desire to be playing and adventuring with her family. She enjoys going for hikes, digging in the sand on the beach, or playing with her friends on the grass and around the house. However, each of these activities require assistance and patience for McKinley to be able to participate. When sitting on the floor she can not transition from lying to sitting, or remain sitting for extended periods without support. When she is in her walker, she can not reach to pick things up off the ground, nor does she have the strength to move up inclines or across uneven terrain. When her friends move at their fully able pace, she is often left behind, and she struggles to manage those emotions. In each of these instances, a service dog will be able to perform valuable, impactful tasks that will improve McKinley’s participation, social engagement, and even her independence. McKinley’s service dog will be able to lay behind her wherever she is seated, providing her affection and support, as well as keeping her safe. Her service dog will be able to help her transition from lying to sitting, and in the future may provide her the support to transition to standing, and even serve as a walking aide. When McKinley is in her walker her service dog may help her travel up inclines, across uneven terrain, descend inclines safely, and will even open doors for McKinley. Her service dog will also be able to retrieve items for McKinley whether she drops them or if they are in a different place. When McKinley’s friends wander, her service dog will remain a steadfast, loyal friend, ever by her side. Her service dog will provide her with emotional stability and support, and affection when she is upset. This support will increase McKinley’s independence as a young girl able to spread her wings, and enjoy the same freedom her siblings and friends are discovering. Donate to this wonderful little girl's campaign now!